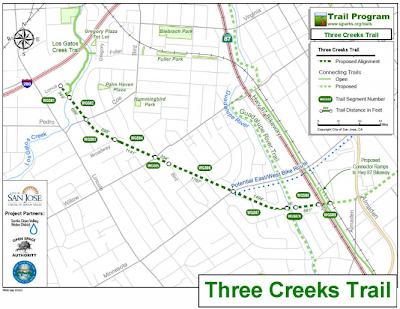 The San Jose Blog: San Jose Three Creeks Trail Moves Forward! 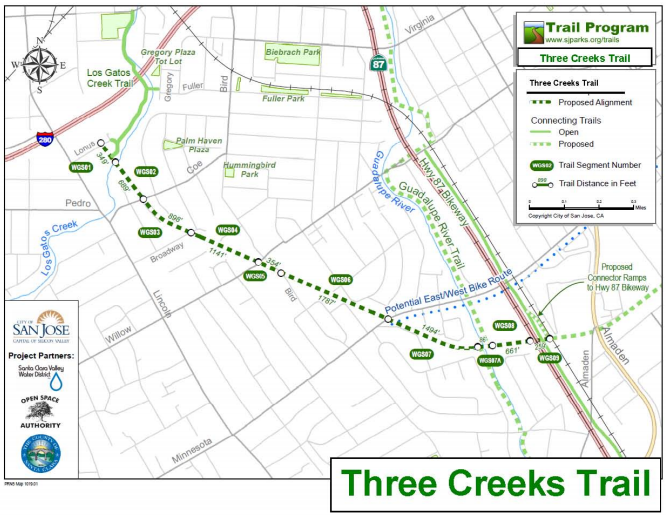 San Jose Three Creeks Trail Moves Forward! Three different agencies have come together to make a critical land acquisition that allow San Jose's Three Creeks Trail project to come closer to realization. The City of San Jose, The Santa Clara County Open Space Authority, and the Parks and Recreation Department of Santa Clara County have jointly chipped in a total of $6M to acquire land and add an additional mile to San Jose's interconnected trail network. This will eventually connect the Guadalupe River, Coyote Creek, and Los Gatos Creek Trails. There are currently 53 miles of trails in San Jose, with plans to bring the total to over 100 miles, making it one of the nation's largest jurisdictional networks. For more info, I highly recommend checking out the press release right over here. Thanks to Yves for the tip!